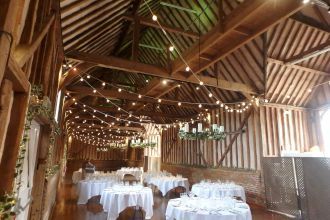 This canopy of festoon lights looked great installed as a series of crosses along the length of the great barn at Lillbrooke Manor. The lights were suspended from the end of one beam to the opposite end of the next, forming a series of crossed strands extending from the bar at one end of the large barn, above the dining area and over the dance floor at the other end. Installed with a simple dimmer control, the lights gave a warm, pretty look to the barn during the wedding breakfast and were then turned down slightly for the dancing in the evening.